The Mercury capsule, the first U.S. spaceship, was a cone-shaped one-man capsule with a cylinder mounted on top. 2 meters long, 1.9 meters in diameter, a 5.8 meter escape tower was fastened to the cylinder of the capsule. The blunt end was covered with an ablative heat shield to protect it against the 3000 degree heat of entry into the atmosphere. 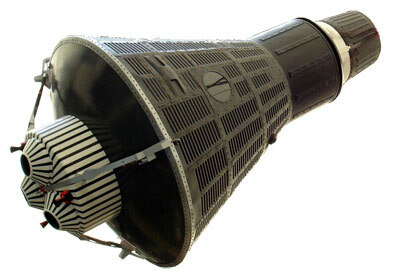 The Mercury program used three launch vehicles: The Little-Joe-1 for escape rocket tests, the Redstone-MRLV for the suborbital and the Atlas-D Mercury for orbital flights. Prior to the manned flights, unmanned tests of the booster and the capsule, carrying a chimpanzee, were made. Each astronaut named his capsule and added the numeral 7 to denote the teamwork of the original astronauts.